When I started doing book reviews, I fully intended to do only OBE books. I didn't expect to cover peripheral topics like lucid dreaming or near-death experiences. But since I had already broken that guideline with Robert Waggoner's book, I decided I would occasionally allow myself to wander outside those boundaries. This is one such case. I promise I'll get back to reviewing pure OBE books. One day my wife, Kathy, came home with a book she had borrowed from a friend. 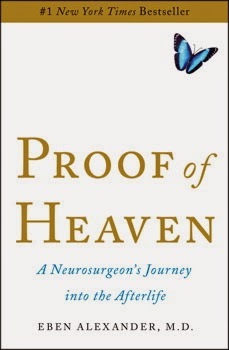 It was Proof of Heaven by Eben Alexander, M.D.. I wasn't all that interested; I had seen it on the shelves in book stores in the past. I thought it was probably just another average lightweight Near-Death-Experience (NDE) book, targeting the masses, but since this is written by a doctor, I also figured it might offer an interesting perspective. So I meant to buy it eventually, but it wasn't my highest priority. But since I didn't own it, I had to bump its priority: I had to read it so she could return it to the owner in a timely fashion. This book was much better than I expected. Yes, the book was written for a wide audience, and it had that warm fuzzy feeling throughout. But there's also a depth that stuck me, and that is the author's unique medical qualifications to describe what was happening from a physical perspective. Basically, this is the story of what happened to the author, a top neurosurgeon, when his body was ravaged by a disease. While this was happening, he had a very intense and complex NDE. His case was unique in the medical field: the recovery rate from this disease was virtually zero. Everyone fully expected him to die. His body had deteriorated to the point where there was absolutely no hope of recovery: It's really a medical mystery (or miracle?) that it didn't kill him. The disease should have destroyed his brain, yet somehow, miraculously, he made a full recovery. It's important to understand something about NDEs: They're tricky. They usually happen to people during cardiac arrest: A person's heart stops, and they have all these weird experiences--a primary feature of which is often an out-of-body experience. But what most people don't realize is that with cardiac arrest, the heart may be stopped, but the brain can still function for a while. That gives skeptics ammunition to dismiss the experience: If your brain is still active but unable to animate your body, maybe your brain is making things up as it goes, right? In other words, fantastic claims such as "I was dead for 5 minutes" sound impressive, but they're not that impressive after all. Cardiac arrest is not the same as brain-dead. What makes this book unique is that it absolutely doesn't have that problem. The author's body was attacked savagely by E. Coli bacterial meningitis. The disease attacks the brain and feeds off the CSF (cerebrospinal fluid). It completely shut down the neocortex of the author's brain. That's the area recognized by scientists as being responsible for all "experience". That's the electrical signals ("brain waves") that are measured with EEG machines. What that means is that he should have experienced absolutely nothing if there was a purely biological explanation for his NDE. Coming from an average person, that would be impressive enough, but the author is one of the best brain surgeons and brain experts in the country. He knows full well what he's talking about. His credentials are impeccable. And he was a huge skeptic of NDE claims, until it happened to him. Another good thing: the author wrote down his experience in great detail before doing any research or reading any books on NDEs, so his descriptions were not tainted by other people's NDEs. I was surprised when, near the end of the book, he noted that you don't need to be near death to explore beyond your physical body. I was cheering him on! He gives a fair amount of credit to OBE pioneer Robert Monroe and the Monroe Institute, for helping him come to terms with his experience and to help him with his ongoing research into NDEs and OBEs. The book is very well written, organized, and concise. It was a bit "lightweight" for guys like me who have been studying this their whole lives, but overall an excellent book.